YOUR MAMAS NOTES: In March 2005, about the time Brad Pitt and Jennifer Aniston called off their short marriage and he hooked up with earth-momma/actress Angelina Jolie, superstar Brad Pitt shelled out a very a-list $8,410,000 for a very contemporary and glassy ocean front bachelor pad perched on 1.26 bluff top acres on the rugged but extremely swank Encinal Bluffs area in Malibu, CA. The well-known architecture buff spent years and millions transforming the 1962 mid-century home into a designer show pad that became Ground Zero for the then still budding affair between Mister Pitt and his current long-time lady-made and baby momma Angelina Jolie. Starting in 2009 rumors began to swirl and make their way around the celebrity real estate merry-go-round about Mister Pitt–and by extension Miz Jolie–wanting to sell the ocean front estate. As far as Your Mama knows–and we really don't know a damn thing–we were the first property gossip to discuss the rumors back in early February 2009 when we heard from Our Lady in Malibu that Mister Pitt had quietly floated the property on the (pocket listing) market with an asking price of $18,000,000. More than two years later the property remains in Mister Pitt's bulging real estate portfolio and yesterday it landed on the open market with a much lower–and arguably much more realistic–asking price of $13,750,000. Listing information shows the low-slung, angular and crisply modern residence measures 4,088 square feet and includes a total of 4 bedrooms and 4 bathrooms. 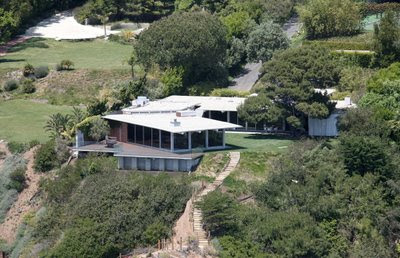 Two of the bedrooms, as per the listing, are currently used as offices, which means when the Pitt-Jolies are in residence in Malibu all 78 of their natural born and adopted children have to share a single bedroom. The primary living spaces have dark bamboo floors and walls of floor to ceiling glass that expose the house to the various courtyards, patios and decks around the house that offer panoramic views up and down the quintessentially dramatic California coastline. The sleek and modern interior areas include living and dining rooms, a family room, and an all-stainless steel kitchen with walk-in refrigerator/freezer. Listing information shows that the house is equipped with radiant heating but no air conditioning but we're guessing the design of the house and the cool coastal breezes make air conditioning unnecessary. Other features, as per the listing, include covered parking for three cars, three fireplaces (two indoors one outdoors), sound and security systems that we can all bet are the finest money can buy, and a private path/stairs to the sandy and somewhat remote beach at the bottom of the bluff. The property slopes dramatically from Pacific Coast Highway to the steep bluff that tumbles down to the sand and sea. A heavily fortified gate opens to a driveway that brings cars past a tennis court and lap-lane swimming pool to a tight motor court at the front of the house. Listing information indicates that plans and coastal approval exists for the addition of a second story designed by architect Chris Sorensen, a Malibu-based architect who specializes in what his website calls "environmentally conscious design solutions." Although the multi-culti Pitt-Jolie clan spend much of their time in Europe where home base is Chateau Miraval, an 880-acre spread in a rural area in the South of France, they maintain a number of pricey and posh pads state side including a secluded ocean front compound just outside of Santa Barbara, CA, a growing compound in the Los Feliz area of Los Angeles and an historic mansion in the French Quarter in New Orleans. Malibu is so overrated. If all you want is a view and to be seen, I guess one would buy. The outside of that house doesn't look very kid friendly. Lots of areas for kids to fall and hurt themselves if they wander off. No wonder Brad is getting rid of it. Is it so difficult to say 6 kids, I wonder is it because some are adopted? Loves it. Kisses to Malibu. "...all 78 of their natural born and adopted children have to share a single bedroom. " 11:15 Are you kidding? 10:27 didn't say 6 kids, because any minute it could be 7 kids or 8 kids. Who knows and who cares how many kids this couple has or where they came from either? The point was the place doesn't look too child friendly, and it sure doesn't. malibu isn't overrated...it's sublimely sited, private and timelessly cool. Anybody know who has the listing? And as for their children, they have indicated they are through, adding to their family that is. Angelina has had Brad's birth place digits tattooed on her arm below the six for her children. And while we are on the subject of many, many children, the Mormons require six children per family, or they don't get the good real estate in heaven. The people with the most kids get the penthouses. (Not kidding.) Is that a great cult or what? I don't care how cool the coastal breezes are, it can get pretty damn hot in LA (even in Malibu), for nearly $14-million, I want air conditioning!!! @ Village:The SS required officers to have at least 4, the Hmong are supposed to have 10, and the Pope & Allah wants their followers to overpopulate endlessly so the Mormon 6 (I thought it was 5?) could be worse. As for the house, sign me up. Ellen Francisco has the listing, according to the Multiple Listing Service. If you have to have air conditioning at the beach, you might as well just buy a house with airplane views of the ocean. The best part of owning a beach house is the breeze. I agree with Anonymous 1:48, Malibu is totally bitchin. Forget Moon Shadows and Mel Gibson, Malibu is a place where millions of dreams are conjured and millions more come true. The only place, on the west coast that even begins to rival Malibu is parts of Corona Del Mar, Newport Beach, and Laguna... although they are much different than Malibu, they are also amazing places. "...78 of their natural born and adopted children have to share a single bedroom." No Mama Dear, you have it backward. it's 87. Love you, love the house! 3:41- agree... Though in a totally non- industry / real housewives way, I would put the homes on the big sur coast on that list! Yeah, keep chanting the Malibu self affirmation "timelessly cool".........just like Keanu Reeves. @1:21, who are you to have an opinion? Shut up. Interesting house, but I've never thought it would be a safe place to bring all of those kids. He owes 8.4 million on this.That is why he is asking so much. He bought it for 8.4 million....Hummmm wouldn"t that be considered a Short Sale??? I spent the day there about 5 months ago. Grossly overvalued at $13,750,000 - the place feels TINY. $13 MILLION dollars and no air conditoning?????? The house isn't showing well to potential buyers they seem to think its way over priced.